Meet Nixxi Rose, during her time as an impoverished student studying Jewellery at Buckinghamshire New University, Nixxi used to enjoy buying in cheap clothing and shoes and then customising these items in her own strange style, colours and designs. 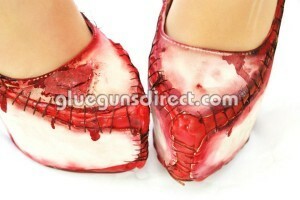 One Halloween she was asked to make a pair of shoes to look as though they were stitched from Human Skin inspired by the serial killer Ed Gein, she used a glue gun to create a drippy gore effect which she then painted red. A photo of these shoes ended up online and word spread quickly, soon she was getting emails from people all over the world requesting their own pair! 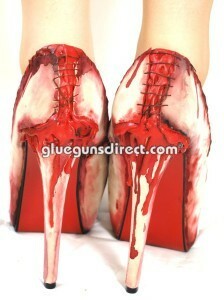 After struggling with small glue sticks, cheap DIY glue gun and messy paint for several months Nixxi came across gluegunsdirect.com who have Tecbond coloured glue sticks in red and other colours within their range, which were perfect for the gory effects and stunning designs, her prayers were answered! Nixxi has since graduated, set up her own business and now uses Tecbond range of coloured glue sticks to create anything from blood and snot to piped icing and melted chocolate! What can we GLUE for you – be creative with Tecbond Coloured Glue Sticks !